SATA stands for serial attached small computer. SATA drive is the cheapest and oldest technology used in servers. SAS stands for Serial attached Small computer system interface. Reliability: SAS MTBF is 1.2 to 1.6 million hours at 45 degree Celsius. However SATA MTBF is 7,00,000 hours to 1.2 million hours at 25 degree Celsius. Access Rate: SATA data transfer rate is up to 6 Gb/s however SAS data transfer rate is 15 Gb/s. SAS data transfer rate is higher than SATA. 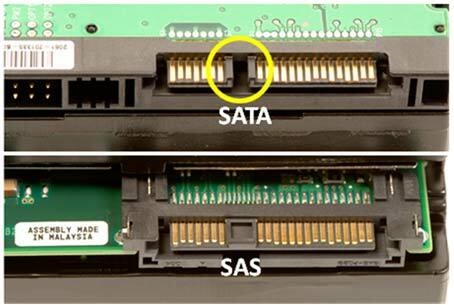 Usages: SATA is majorly used in personal computer, low end servers however SAS is used in high end servers. Running Speed: SAS drive works between 7200 RPM to 15000 RPM. However SATA drive works between 5400 rpm to 7200 rpm. Storage: SATA drive has much better storage capacity then SAS. Most of SAS hard-drives comes with 600 GB storage however SATA hard drive have 2 TB space and more. Power Consumption: Power consumption of SAS hard drives is higher than SATA hard drives. It is recommended to opt for SAS storage where response time requirement from applications hosted on server is less. SAS hard drive works very fast. However in case storage requirement is high and budget is low then it is recommended to opt for SATA hard drives.